Welcome to the Spring 2017 UK-QSAR Newsletter! The spring UKQSAR meeting on 26th April will be held at Syngenta, Jealott’s Hill. Registration closes on 22 April so do book your place if you haven’t already for what looks like a fascinating and wide-ranging array of talks and posters. Our Autumn 2017 meeting will be held at at the MIB in Manchester on 29th September, hosted by C4X, and will focus around the there “Where simulation meets experiment”. And if you can think as far as a year ahead you can start looking forward to our planned joint MGMS/UKQSAR Group meeting in Cardiff, on 11th-12th April 2018 (provisional dates). UK-QSAR meetings are often oversubscribed so do register asap to avoid disappointment. If you have registered already but can no longer attend PLEASE LET US KNOW so we can release your place. Details of the talks and some suggested pre-meeting reading material is available below should you wish to explore some of the upcoming topics in more detail ahead of the meeting. The UKQSAR spring meeting will be returning to Syngenta, Jealott’s Hill on 26 April. As ever, we’re aiming to offer a series of high quality talks around a range of topics, in this case formed around a couple of broad themes – understanding the lead optimisation process and characterising the shape of ligands and binding sites. The lead optimisation process is a crucial step in the drug discovery effort as it is the route by which a large number of molecules are turned into “the one” – the compound that goes forward to expensive trials with the hope that it will eventually become a profitable product. The fate of this compound is baked into its structure, ranging from its efficacy to its toxicological profile, so it behoves us to make sure that our process really does lead us to the right “one”. Within our community we often focus on the detail of how properties are predicted – a better model of solubility, an improved docking algorithm, a faster clustering method – rather than asking how these improvements might impact the overall drug discovery process. For example, is it better to have a good model of a less relevant parameter or a poor model of a more relevant one? Some of these issues will be addressed in the morning session with a series of talks that focus on how the choices we make during the lead optimisation process shape its final outcome. This ranges from where our initial leads come from, through the effect of cognitive bias during the design cycle through to the impact of physical properties on chances of success of candidate molecules. Molecular recognition is primarily driven by the complementary shapes of a ligand and its binding site. Shape offers us a different view on compounds, potentially allowing us to move more easily away from problematic chemotypes while retaining the ligands essential interaction with its target. The afternoon session will be given over to considering our molecules in terms other than their flat structure, with talks about methods for accurately identifying potential ligand binding sites on proteins, visualising these pockets as interpretable maps to aid drug design and grouping molecules effectively by shape fingerprint. Jealott’s Hill is a key site in Syngenta’s global Research and Development network. With a long tradition of innovation and employing over 800 people, it is the company’s largest site for new agrochemical R&D and product support. 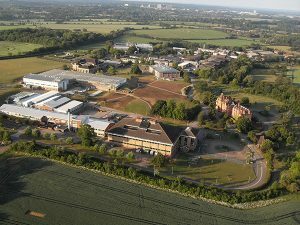 Key activities at Jealott’s Hill include research into discovery of new active ingredients, new formulation technologies, product safety, technical support of our product range and seeds research. The site houses a number of centres of scientific excellence, both chemical and biological, that support our worldwide R&D activities. The UK-QSAR group is working with the Molecular Graphics and Modelling Society (MGMS) to organise a joint meeting in Spring 2018 at the University of Cardiff. The theme of the meeting will be “Structure-Activity Relationships”, a broad area that appeals to members of both organisations. The meeting will be a two-day event, similar in format to the joint UK-QSAR PhysChem Forum meeting held in 2016; talks will commence after lunch on the first day and finish at the end of the afternoon on the second day. Registration will be free of charge, as is normal at UK-QSAR meetings, but there will be a conference dinner on the evening of the first day which will be charged for and therefore is optional to attend. A programme committee made up of members from both the UK-QSAR and MGMS committees is currently organising the schedule of speakers. Keep a close eye on the UK-QSAR and MGMS websites (www.ukqsar.org and www.mgms.org) for further information on the programme, later this year. So, please put Wednesday and Thursday, 11th and 12th April 2018 into your diaries – and mark the venue as the University of Cardiff, in the capital of Wales, a city which has enjoyed a great renaissance in recent years. We’re looking forward to seeing you in Cardiff! / Rydym yn edrych ymlaen at eich cyfarfod yng Caerdydd! Latini, S.; Pedata, F. Adenosine in the Central Nervous System: Release Mechanisms and Extracellular Concentrations. J. Neurochem. 2001, 79 (3), 463–484. Shook, B. C.; Rassnick, S.; Wallace, N.; Crooke, J.; Ault, M.; Chakravarty, D.; Barbay, J. K.; Wang, A.; Powell, M. T.; Leonard, K.; Alford, V.; Scannevin, R. H.; Carroll, K.; Lampron, L.; Westover, L.; Lim, H.; Russell, R.; Branum, S.; Wells, K. M.; Damon, S.; Youells, S.; Li, X.; Beauchamp, D. a; Rhodes, K.; Jackson, P. F. Design and Characterization of Optimized Adenosine A₂A/A₁ Receptor Antagonists for the Treatment of Parkinson’s Disease. J. Med. Chem. 2012, 55 (3), 1402–1417. Schmidt, C. J.; Chapin, D. S.; Cianfrogna, J.; Corman, M. L.; Hajos, M.; Harms, J. F.; Hoffman, W. E.; Lebel, L. a; McCarthy, S. a; Nelson, F. R.; Proulx-LaFrance, C.; Majchrzak, M. J.; Ramirez, a D.; Schmidt, K.; Seymour, P. a; Siuciak, J. a; Tingley, F. D.; Williams, R. D.; Verhoest, P. R.; Menniti, F. S. Preclinical Characterization of Selective Phosphodiesterase 10A Inhibitors: A New Therapeutic Approach to the Treatment of Schizophrenia. J. Pharmacol. Exp. Ther. 2008, 325 (2), 681–690. Giampà, C.; Patassini, S.; Borreca, A.; Laurenti, D.; Marullo, F.; Bernardi, G.; Menniti, F. S.; Fusco, F. R. Phosphodiesterase 10 Inhibition Reduces Striatal Excitotoxicity in the Quinolinic Acid Model of Huntington’s Disease. Neurobiol. Dis. 2009, 34 (3), 450–456. Niccolini, F.; Foltynie, T.; Reis Marques, T.; Muhlert, N.; Tziortzi, A. C.; Searle, G. E.; Natesan, S.; Kapur, S.; Rabiner, E. a.; Gunn, R. N.; Piccini, P.; Politis, M. Loss of Phosphodiesterase 10A Expression Is Associated with Progression and Severity in Parkinson’s Disease. Brain 2015, 138, 3003–3015. Pérot, S.; Sperandio, O.; Miteva, M. A.; Camproux, A.-C.; Villoutreix, B. O. Druggable Pockets and Binding Site Centric Chemical Space: a Paradigm Shift in Drug Discovery. Drug Discov. Today 2010, 15 (15-16), 656–667. Meyers, J.; Brown, N.; Blagg, J. Mapping the 3D Structures of Small Molecule Binding Sites. Cheminf. 2016, 8 (70). J. Radoux, T. S. G. Olsson, W. R. Pitt, C. R. Groom, T. L. Blundell, J Med Chem, 2016, 59, 4314–4325. A. Haigh, B.T. Pickup, J. A. Grant, A. Nicholls, J. Chem. Inf. Model. (2005) 45, 673–684.